Analog Devices EV-ADF41513 Evaluation Boards are demonstration and prototyping boards utilised to evaluate the features of the ADF41513 PLL Synthesizer. These boards each comprise a premounted ADF41513, a 100MHz reference (crystal oscillator (XO)), a loop filter, and low noise voltage regulators. The EV-ADF41513SD1Z Evaluation Board needs an external VCO. SMA connectors are offered on the board to connect the charge pump output (VTUNE) to the tuning input of the VCO and the PLL RF input (RFIN) to the VCO output. 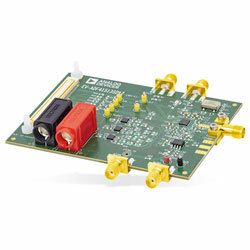 The EV-ADF41513SD2Z Evaluation Board comprises an on-board 10GHz to 20GHz HMC733 VCO. The boards both require the SDP-S Controller Board, which is not supplied with the kit. The SDP-S Controller Board is based on a USB to Serial Engine offering connectivity to a PC via a USB 2.0 high-speed port. The controller board enables software programming of the ADF41513 device.